In the first installment of the A Fire Beneath the Skin trilogy, the city of Klaar has never fallen. No enemy has ever made it across the Long Bridge or penetrated the city's mighty walls. Even when a powerful invading army shows up at the gates, the duke and his daughter, Rina Veraiin, are certain that it poses little threat. But they are cruelly betrayed from within and, in a horrific spasm of violence, the city is brought to its knees. The world of Dematr had been locked unchanging for centuries by the Great Guilds, most people living in a world of oil lamps, crossbows, and horse cavalry, the Mechanics reserving to themselves the technology for steam locomotives, rifles, and far-talkers while the Mages treated all others as if they were nothing - until Master Mechanic Mari, dragon slayer and pirate queen, and Master of Mages Alain raised the army of the new day to free their world. Why would we need music if our lives were exactly as we wanted them to be? Karl Bender is a quiet guy who lives in three places: his bar, his apartment, and the cheap Mediterranean place on the corner that keeps him well fed with his daily portion of hummus and chicken shwarma. But that's all about to change. When he stumbles upon a time-traveling wormhole, Karl develops a business selling access to people who want to go back in time to hear their favorite bands. Alex Verus is part of a world hidden in plain sight, running a magic shop in London. And while Alex's own powers aren't as showy as some mages, he does have the advantage of foreseeing the possible future-allowing him to pull off operations that have a million-to-one-chance of success. 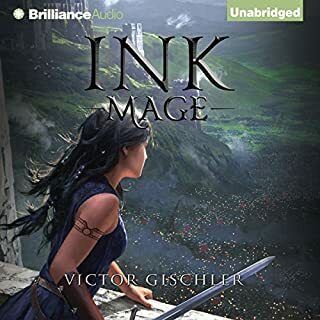 But when Alex is approached by multiple factions to crack open a relic from a long-ago mage war, he knows that whatever's inside must be beyond powerful. In 1988, 43-year-old Jeff Winston died of a heart attack. But then he awoke, and it was 1963; Jeff was 18 all over again, his memory of the next two decades intact. This time around, Jeff would gain all the power and wealth he never had before. This time around he'd know how to do it right. Until next time. Pilot X is Ambassador of the Alendans, a race with the ability to move through space and time as guardians of the timeline. Locked in ongoing conflict with the Sensaurians, an organic hive mind that can send messages in thought throughout its own history, and the Progons, a machine race who can communicate backwards in time, Pilot X finally manages to create peace among the three races. Each winter the crew at the Shackleton South Pole Research Facility faces nine months of isolation, round-the-clock darkness, and one of the most extreme climates on the planet. For thirty-something mechanical engineer Cass Jennings, Antarctica offers an opportunity to finally escape the guilt of her troubled past and to rebuild her life. But the death of a colleague triggers a series of mysterious incidents that push Cass and the rest of the forty-four-person crew to the limits of their sanity and endurance. Sam Hunter is a bit of an animal. He's a former Twin Cities cop who lost his badge because of excessive force. Abusive husbands, child molesters, and other lowlifes wound up looking like they'd been mauled by a dog...or a wolf. Now Sam's a low-rent PI in Philadelphia. He takes the kinds of cases no one wants. His clients are usually on the fringes of society. The kind who are prey for all manner of predators - human and otherwise. They came after the Diseray. Some were terrors ripped from our collective imaginations, remnants of every mythology across the world. And some were like nothing anyone had ever dreamed up, even in their worst nightmares. Long ago, the barriers between our world and the Otherworld were ripped open, and it's taken centuries to bring back civilization in the wake. Now, the luckiest Cits live in enclosed communities, behind walls that keep them safe from the hideous monsters fighting to break through. Others are not so lucky. To Joyeaux Charmand, who has been a Hunter in her tight-knit mountain community since she was a child, every Cit without magic deserves her protection from dangerous Othersiders. Then she is called to Apex City, where the best Hunters are kept to protect the most important people. Joy soon realizes that the city's powerful leaders care more about luring Cits into a false sense of security than protecting them. More and more monsters are getting through the barriers, and the close calls are becoming too frequent to ignore. Yet the Cits have no sense of how much danger they're in - to them, Joy and her corps of fellow Hunters are just action stars they watch on TV. When an act of sabotage against Joy takes an unbearable toll, Joy uncovers a terrifying conspiracy. There is something much worse than the usual monsters infiltrating Apex. And it may be too late to stop them. 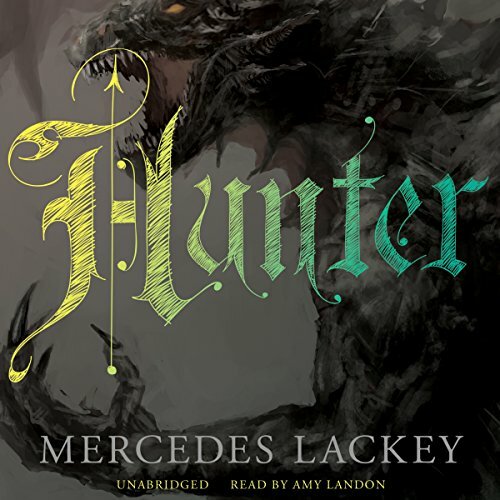 ©2015 Mercedes Lackey (P)2015 Blackstone Audio, Inc. This is the personal story of a girl, newly released from an isolated society, with a mission to protect people and slay monsters. Though the descriptions in the book are a little dull, the world built is interesting and full of history. 1. There are 1.5 interesting characters, the villain and half of the main character. After 3 hrs, one would expect there to be a cast of some kind, but there isn't. 2. This is a first person story narrated by an emotionless robot. Combat, social tension, introspection, and scenic description are all read exactly the same way. It can be difficult to identify if the main character is speaking or narrating. This makes the story incredibly dull; so much so, I struggle to find the desire to finish it. I will be avoiding Amy Landon in the future. I'll start by saying I'm a HUGE Lackey fan and have been for almost 15 years. I will say that some of her more recent stuff had started to feel a little stale. This however is a very big departure (in my opinion) from her usual stuff. I really like that she decided to take a stab at distopian/post-apocalyptic type stuff because he take on it is just similar enough and just different enough to be exciting. I will agree with other reviewers in that Joy is very Katniss-esque but the introduction of magic and fairytale into this genre really makes what could have been a boring repeat of Divergent and The Hunger Games into something new and exciting. That being said there was the similar Lackey pitfall of most of her characters in that the main character's internal monologue got extremely tedious at times. Lackey does action very well but when the action gets paused for a seemingly endless string of "what ifs" it can be a bit maddening. That was truly my only complaint with the story though and I'm really looking forward to the next installment in this exciting new series. My only other complaint would be that the narrator did one very dull, deep, slow voice for every male character and it got very old very fast, not to mention confusing. 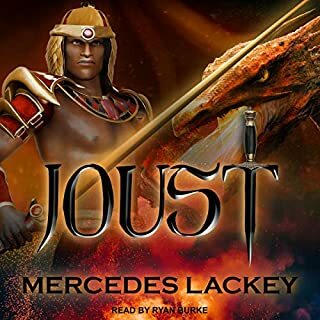 Overall though I'd say this book was well worth the credit and got me excited for a Lackey series in a way I haven't been since I first found Talia. This may have been a good book....maybe. But...first, it is way too shallow and predictable. Second, the narrator is just too monotonous and her speech patterns are too predictive and repetitive and emotionless. I tried to finish the book but I just couldn't. This is a unique approach to a fantasy world and a very engaging listen. More sophisticated than the usual Mercedes Lackey story yet still has her flair for creating memorable characters. The performance was very good though I wish the narrator could have differentiated the "voices" of the different characters a bit more on occasion. I look forward to the next book but do not feel like the story ended prematurely...it ended at a good stopping point. 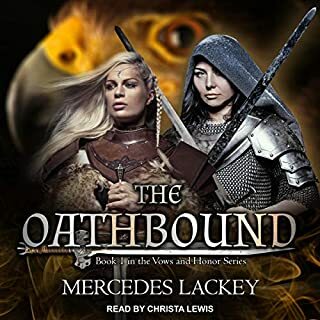 Highly recommended for any Mercedes Lackey fan and for those that like a not-too-grim fantasy story that doesn't read like a YA novel. I'm not a huge fantasy fan but this was an engaging mix of fantasy, sci-fi, post-apocalyptic, and dystopia. The writing was excellent (as was the audio narrator) and the story was original and interesting. All characters were well developed. The first person narrator (Joy) is sixteen, but she's not an obnoxious teenager with concerns that annoy adult readers. Yes, there is a love interest but there's no insta-love and no ridiculous teenage love triangle. There's some diversity (e.g., one female character has an ex-wife, not everyone is white)--always a plus. I'm thinking about what the other reviewer said about if you liked the Hunger Games, you'll like this. I did, and I did but it doesn't resemble the Hunger Games in any substantial way. Amy narration was to robotic. Great new series by one of my favorites! This book is classic Lackey, in that it drew me in immediately and I couldn't put it down. However it's also so new that I'm incredibly excited! The new magic system is great and I can wait to hate the 'folk' more. I love Joy! She's strong, independent, smart. She still gets flirty with men, but thankfully doesn't loose her head like many heroines. I think I like her integrity best. She reminds me of Honor Harrington (Honor Harrington series by David Weber) and Kel (Protector of the Small by Tamora Pierce). The audible is great. 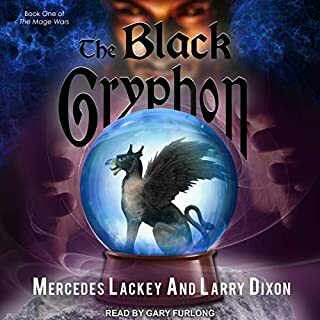 Amy Landon brought this so thoroughly to life that it was like Joy in my ear telling her story as I was transported to her world. Loved the hounds - when do we see book 2? I don't like stories where the protagonist acts like an idiot until just before the end of the book when he or she finally realizes what a jerk they have been and painfully wise up. This book will not put you through that. Joy is a thinking , well trained , and savvy warrior and is a whole lot of fun to cheer for. The hounds are wonderful and I cain't wait to hear more about them. When is the next book? Starts off weak, but ends quite strong. The first two hours or so are rough. There's no getting around it. 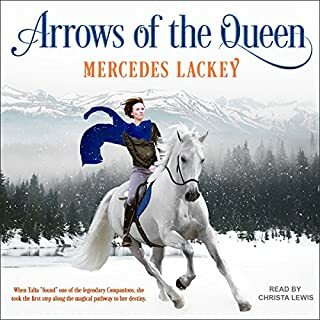 Part of me feels like since so many of Lackey's books take place in worlds that she's been writing for decades, she's a bit rusty on introducing an entirely new world to readers. Lots of info dumping, etc. Stick with it though, you won't be sorry. After you get past that first 20%, the story takes on a new life that's exciting and interesting. In some ways it reminds me of the Hunger Games with the heroes having to pick out color themed wardrobes, and having camera follow them everywhere before going out to engage in potentially deadly combat, but the similarities end there. Instead we have are city defense workers, in a future where creatures of legend have become real, and for the most part seem to like hurting humans. What's worse, most of humanity has forgotten most of it's folk lore, and pop culture knowledge of the supernatural, and these have become regarded as academic subjects to aid in survival. It's not entirely clear if humans are lucky in this regard or if the different creature types are aggressive to each other. I like the way she describes -how- magic works. We get just enough details to feel like &quot;Ah, I get it.&quot; without an info dump that would make us feel like we could write a thesis on magic if we stayed away through it. She paces the delivery of this information well so that we get just what we need to be on board with the scene, and then move on. The character is likable without trying too hard to make her sympathetic or an outsider. She could easily get a big head, but that doesn't happen. We get the idea that she comes from a territory far away from most of her peers, but we aren't left feeling like we need to pull out a tiny violin for her, because the character is social enough to adapt. The protagonist is a 'special girl' as some reviewers like to say, but not so special that there might as well be the only person in the story. As of the first book, she knows her stuff, and has a few advantages, but they aren't so great that she could single handedly dominate all the other hunters combined. Her &quot;special&quot; qualities are more a result of how she's been trained to think than her actual capabilities, and other hunters are revealed to be able to duplicate some of her tricks if they can wrap their minds around how she approaches things. Bottom line - she's awesome at what she does, but isn't a chosen one terminator style character. Somewhat related to the last point, I like that Lackey uses the protagonist's education as a double edged sword. Rather than have her go into every situation assuming she's the best, she takes care to remind us that it's entirely possible that the other hunters have tricks and abilities that she's never thought of which keeps her on her toes. That first 20-25% of the book was no bueno. It feels like a totally different person wrote those pages. I'm surprised that the publisher didn't require some significant edits before releasing this book. Real rating: 4.4 stars. Would have been 5 if not for the Meh and the Bad. On performance, Amy Landon is one of my favorite readers, and she does a good job with this novel. From what I understand, she was given specific instructions to warp the pronunciation of some words to make the world seem related to our own, but still quite different. Unfortunately, there are a few instances where that pulled me out of the listen, overall however Landon's performance is solid. I've read and loved other books by this author. She always tells good, solid, captivating stories. 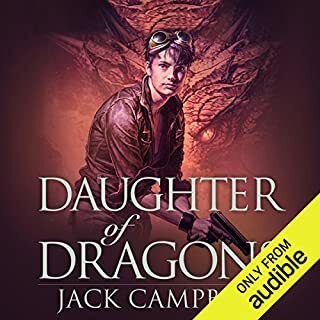 While this book's similarities to other survival/female fighter-genre books makes it seem a bit unoriginal at first glance, the writing is solid and overall this book was a great read.